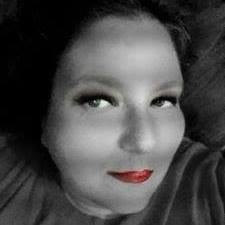 When Halloween is everything, you wanna show your spirit year around. 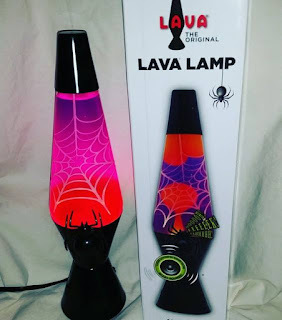 Or you would be our 9-year-old son, Wade and think this is just a super cool Lava Lamp. Either, way we can guarantee this lamp is as nifty as can be! The lamp is filled with purple liquid and a yellow wax. Once step-up it takes between 2 - 3 hours for the "lava" to take effect. Not to even mention the detachable spider is sound-activated and makes a witchy cackle. This is just one of the many Lava Lamp and other products offered from this bright company! This spooky lamp contains a removable, spider that has a sound-activated chip that will shriek at those brave enough to pass it. Watch the Lava move up and down the spider web frosted globe resting on a black painted, hand-spun base and cap. 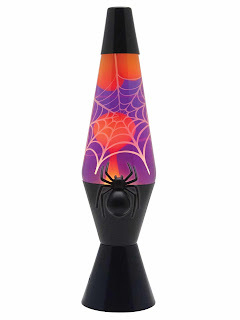 Make your next Halloween SPOOKTACULAR and enjoy the colorful motion of this creepy version of the timeless Lava®lamp.